Tasty Tuesday – Apple Pie | Who Are You Calling Crafty? For some strange reason this Thanksgiving I wanted Apple Pie, Jeff bought some amazing apples and I needed to bake with them. I have been slowly trying some of my great grandmother’s recipes, one of the recipes I have is for a LARD pie crust. 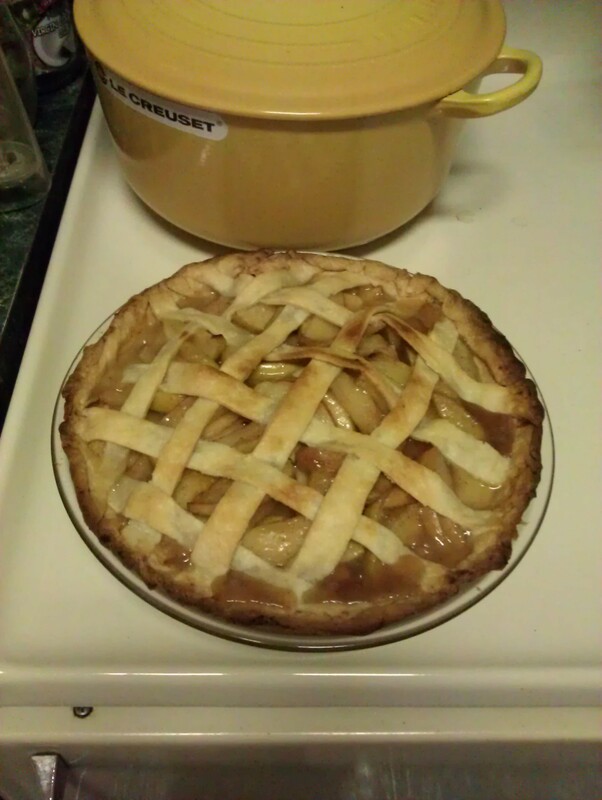 I decided I needed to make some apple pie with my great-grandma’s pie crust recipe. I’m not going to post my great-grandma’s recipe (I don’t want to be cursed) but what I can tell you, it is a 1:1 substitute for shortening. The shortening leaves everything lighter and it does brown faster so keep your pie covered until the last 15 minutes of baking. Heat oven to 425. Prepare pastry. Mix sugar, flour, nutmeg, cinnamon and salt. Stir in apples. Turn into pastry-lined pie plate; dot with butter. Cover with top crust that has slits cut in it; seal and flute. Cover edge with 3″ strip of aluminum foil; remove foil during the last 15 minutes of baking. Bake until crust is brown and juice begins to bubble through slits in crust, 40-50 minutes. It was excellent! I don’t peel my apples I leave the skins on, they make the flavor of the apple pie, I am also lazy and hate peeling apples. « 29 Days Until Christmas?!?!? !